Steel Magnolias, a 1987 play by Robert Harling, centers on the bond among six southern women in the 1980s in the fictional setting of Chinquapin Parish, Louisiana and how they cope with the untimely death of a young mother within their tightly knit circle. 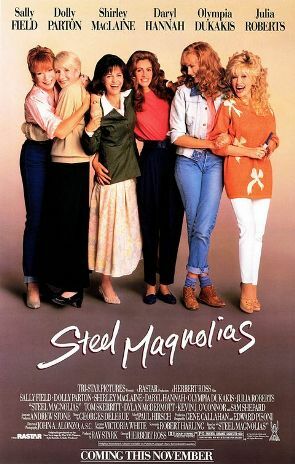 A reproduction of the 1989 movie poster for Steel Magnolias. Steel Magnolias, a 1987 play by Robert Harling, centers on the bond among six southern women in the 1980s in the fictional setting of Chinquapin Parish, Louisiana and how they cope with the untimely death of a young mother within their tightly knit circle. Harling’s work, with elements of tragedy and comedy, was inspired by the playwright’s hometown of Natchitoches and the death of his sister, Susan Harling Robinson, in 1985 due to complications from diabetes. The play’s title has become a metaphor for Southern femininity: a strong emotional core beneath a delicate-looking exterior. In 1989 Steel Magnolias was adapted into a movie under the direction of Herbert Ross; it was filmed on location in Natchitoches. A made-for-television version starring an all-African American cast was released in 2012. On stage, the action takes place on a single set: a hairdresser’s salon known as Truvy’s Beauty Spot. The six characters include mother and daughter M’Lynn and Shelby Eatenton; Clairee Belcher and Ouiser Boudreaux, loudmouth grande dames of the small town; the wisecracking Truvy Jones; and her new mousy shop assistant, Annelle Dupuy. Clairee, widow of the former mayor, enters the shop as a shotgun fires in the distance. Shelby and her mother M’Lynn arrive, and the audience learns that it is Shelby’s wedding day and that the gunfire is Shelby’s father’s attempt to shoo away blackbirds from their yard, the site of the wedding reception. In the midst of hairdressing and talk about the wedding, Shelby’s head drops down and the ladies spring into action. After getting a glass of orange juice and helping Shelby drink it, the ladies explain to Annelle that Shelby is a diabetic and has experienced an insulin-level spike. During the seizure, M’Lynn tells the women that Shelby’s doctor recently told her that she should not have children; Shelby suddenly blurts out that she and her husband-to-be could adopt, adding, “We’ll buy ’em if we have to.” When she regains her focus, she’s embarrassed, but the ladies appear composed, politely ignoring the previous commotion. Ouiser (pronounced “Weezer”) arrives soon thereafter, furious at M’Lynn’s husband for the racket he’s been making. The scene ends with Ouiser ordering her dog Rhett to attack him. This opening scene underscores Harling’s brisk style as a playwright: by the time all six characters appear on stage—only about twenty pages in—the main plotlines and conflicts are established, and the tone has moved from light to dark and back again. Act Two is eighteen months later, and Shelby is getting her hair cut short as the other ladies enter the beauty shop. The audience learns that Shelby’s young son is doing well, but Shelby is not. The next day she is getting a kidney transplant, and her mother will be the donor. Her kidneys failed because of her pregnancy, and she has been undergoing dialysis for months. The film featured an all-star cast: Julia Roberts as Shelby, Sally Field as M’Lynn, Dolly Parton as Truvy, Olympia Dukakis as Clairee, Shirley MacLaine as Ouiser, and Darryl Hannah as Annelle. Harling’s screenplay remains relatively true to the original, except for the previously unseen male characters and numerous scenes filmed around Natchitoches. Despite lukewarm reviews—one critic called it “a small play made big by Hollywood”— the film did well at the box office. Released by Tri-Star Pictures on November 15, 1989, it ranked number four at the box office on its opening weekend and went on to gross more than $83.7 million worldwide. Roberts won a Golden Globe Award for Best Performance by an Actress in a Supporting Role in a Motion Picture and was nominated for an Oscar. Lifetime Television Network produced a remake in 2012 under the direction of Kenny Leon, featuring African American actors in the lead roles: Queen Latifah as M’Lynn, Jill Scott as Truvy, Alfre Woodard as Ouiser, Phylicia Rashād as Clairee, Adepero Oduye as Annelle, and Condola Rashād as Shelby. Uskali, Thomas "Steel Magnolias." In https://64parishes.org Encyclopedia of Louisiana, edited by David Johnson. Louisiana Endowment for the Humanities, 2010–. 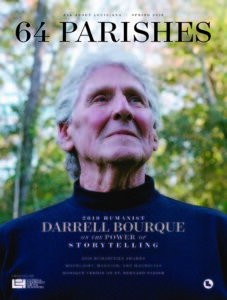 Article published October 28, 2014. https://64parishes.org/entry/steel-magnolias. Canby, Vincent. “Magnolias of the Stage Writ Large for Screen,” The New York Times, November 15, 1989. Gussow, Mel. “Steel Magnolias, A Louisiana Story,” The New York Times, March 27, 1987. Harling, Robert. “Steel Magnolias.” New York: Dramatists Play Service, 1988. Nathan, Sara. “Steel Magnolias Writer on the Real Story Behind the Hollywood Hit,” Daily Mail (London), March 28, 2014.